Books by Joseph James | Complete Set 7 Books **Christmas Special [CompSetJJ7] - $81.94 : Beneficial Zone, Everything is permissible, not everything is beneficial! 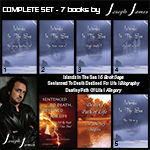 *** SPECIAL - Get all six of Joseph James books at a discount rate. (Retail Value $101.89 - Save $19.95 - The SDDL book is completely free!) Book 5 of the Islands In The Sea Saga is now in Pre-Press. Book 5 will ship as soon as it's published.